Trolarin / The Trawler, is an 8 oar boat, built by Thomas Thomsen (Tummas í Bug) in Sumba in 1901. On 5th of January 1904 Trolarin is registered at the sheriffs office on Suðuroy and given a license to fish cod. The boat was registered as 24,6 feet long, 5,55 feet wide and 1,95 feet deep. 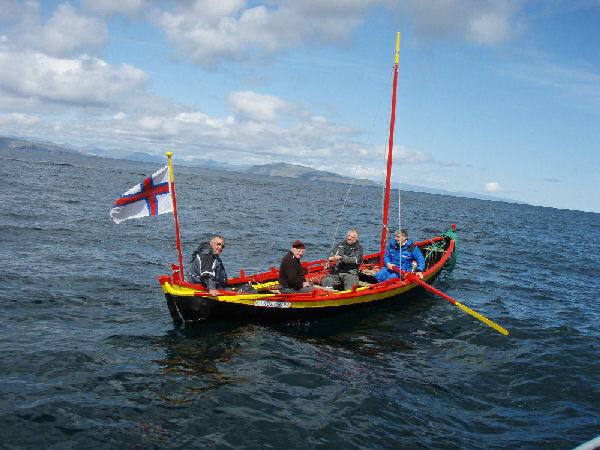 The boat was originally built for 3 men from the town of Tvøroyri, but in September 1904 the boat was sold to Vágur. The new owners were: Johan Olaus Joensen (Lávus við Misá), Hans Mohr Joensen (Hans Mohr við Misá), Thomas Johan Joensen (Tummas í Líðini), Óli Johan Augustinussen (Óli við Hvanndalsá), Niels Jacob Joensen (Jákup á Mýri), Jesper Alexander Niclasen (Sandur í Hovi), Jógvan Joensen (Jógga), and Niels Juel Niclasen. The boat was bought as a fishing boat, but has also been used as a whale hunting boat.